Isis was the mother of Horus and the sister and wife of Osiris in the mythology of ancient Egypt. She was honored as the goddess of the earth and the moon, a symbol of motherhood and fertility. Isis was also worshiped in the Greek and Roman empires. 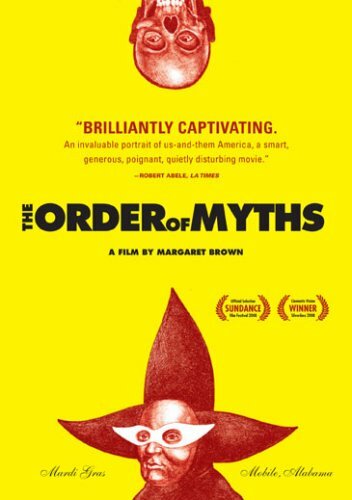 She was traditionally represented as a woman wearing a cow's horns with a solar disk between them. In 1973 this all-female organization was charted in the city of Kenner, and the women held their first 7 processions there before adopting the standardized veterans Memorial Boulevard parade route, which more than a dozen Jefferson krewes share. 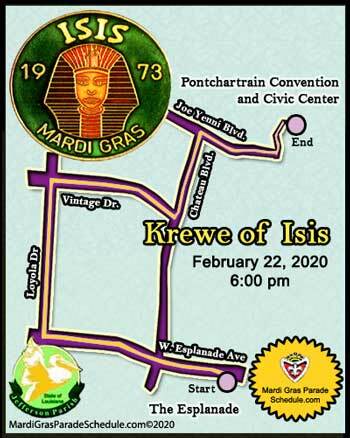 Krewe of Isis is the oldest and largest all ladies Mardi Gras organization in Metairie. Krewe of Isis always rolls the Saturday before Mardi Gras down the traditional Veterans Memorial route, weather permitting of course. Typically, we have 250 female riders, 21 floats and 10 marching bands / dance teams. Ponchatoula High School has always led off the parade since the beginning. And speaking of the beginning,the Captain, Joyce Blondeau, has been Captain since day one as well. Traditionally, the Krewe of Isis is noted for its delightful assortment of floats and the spectacularly attired maids are always a standout. Throws: Beads, Beads, and Beads!!! The krewe is also know for throwing decorated pairs of flip-flops and other Isis specialty throws.